Enjoy a 45 minute glass bottom boat cruise through the ruggedly spectacular Shoalwater Islands Marine Park. The highlight is visiting Australian sea lions at Seal Island before concluding on Penguin Island in time for the penguin feeding. Enjoy a 90 minute cruise to see wild dolphins, sea lions and the ruggedly spectacular Shoalwater Islands Marine Park before concluding on beautiful Penguin Island to see the penguin feeding. Includes Discovery Centre entry and return ferry. 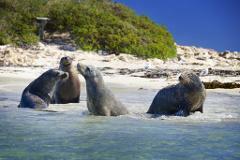 Enjoy a 45 minute glass bottom boat cruise through the ruggedly spectacular Shoalwater Islands Marine Park. The highlight is visiting Australian sea lions at Seal Island before concluding on Penguin Island.